The ZiS-12 (94-KM) (94-KM gun mount on a ZIS-12 truck), or as the 94-KM ZIS-12, is a Rank II Soviet self-propelled anti-aircraft vehicle with a battle rating of 3.7 (AB) and 3.3 (RB/SB). 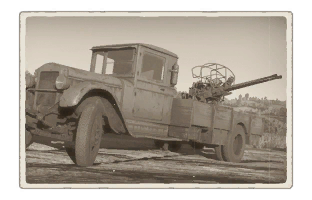 It was introduced in Update 1.57 "Battle March". The 94-KM is an improvement over the GAZ-MM (72-K) with its dual-mounted 25 mm cannons, increasing its rate of fire and area of saturation for anti-aircraft duties. The wheels are 2 mm thick. The truck bed is 15 mm of wood, which will probably not offer as much protection as the truck cab. The radiator housing is unarmoured. (Armour Piercing tracer – Fragmentation Incendiary tracer) shell 50% of this belt are useless against tanks or planes. However against other SPAA this belt can reliably take out crew, armament, ammo and engine. Having one belt in reserve does not hurt. (Fragmentation Incendiary tracer) shell The "explosive" rounds for the gun. 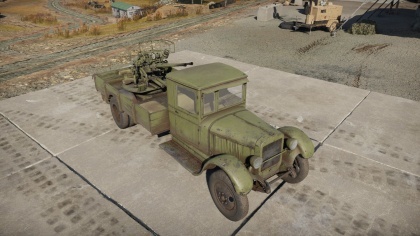 This is the best ammo to use against aircraft, but useless against ground vehicles. (Armour Piercing tracer) shell As an armour-piercing round, it is too small to be a significant threat against ground targets but the lightest armoured ones, and has little effect on planes unless a good shot hits a critical area. Not really a recommended belt to use, but in an emergency it may save the vehicle. Ammo racks of the 94-KM. This anti-aircraft gun is used similarly as the 72-K GAZ MM and is armed with not one, but two 25 mm cannons that dish out twice the damage. Get to a good vantage point using the vehicle's speed, and then use the cannons to shoot down aircraft that threaten the team. Beware of any tanks or aircraft, as even machine guns can destroy the vehicle. If faced with light tanks, try to run away with the high speed of the vehicle, or try to destroy it using the cannons. The 25 mm's will offer enough penetration to go through most of a light tank's armour. A good strategy might be to flank the enemy team or an individual and attack it from the side. Caution should be paid to what tank you are shooting at, although the AP clip is effective against the side armour of most tanks this vehicle will be up against. Heavy tanks should be avoided, unless the ZiS-12 is serving as a distraction for the team or you are sure that you can pen their armour. Again, being shot by anything will often result in your vehicle being destroyed or put out of action. Although this vehicle is speedy, speed alone will not be enough to avoid enemy shots and machine-gun fire. 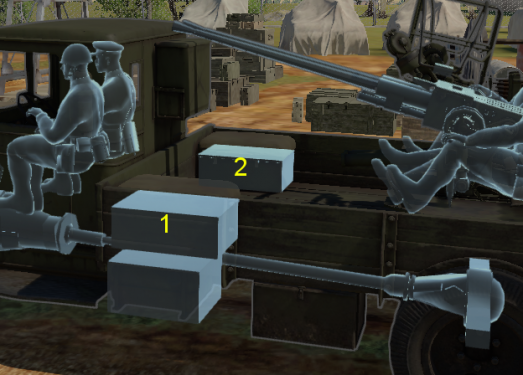 One way to help mitigate the damage your vehicle might take in an engagement is by reversing up a hill, depressing your barrels over the ridge, only exposing two of your four crew members. Even if you do get shot, the driver and commander will usually survive, allowing you to escape. Soviet mobile anti-aircraft defences in World War II was quite lacking in comparison to other nation's. Their self-propelled anti-aircraft guns are mainly improvised truck beds mounting a light anti-aircraft gun, such as Maxim machine guns on the GAZ-AAA (4M) and a single 25 mm autocannon in the GAZ-MM (72-K). By the end of 1943, the design bureau at Plant no.88 wanted to mount two 25 mm 72-K guns onto a truck bed. The guidance system on the new design was derived from the 37 mm 61-K gun. The gun system was mounted onto the back of a ZIS-12 truck bed, which was derived from the ZIS-5 truck. In 1944, the weapon system was accepted for testing and later approved as the 94-KM ZIS-12. Plant no.88 produced the 94-KM from 1944 to 1945 before stopping at either production number 225 or 237, possibly due to the introduction of the better ZSU-37 anti-aircraft system. This page was last edited on 25 March 2019, at 00:51.